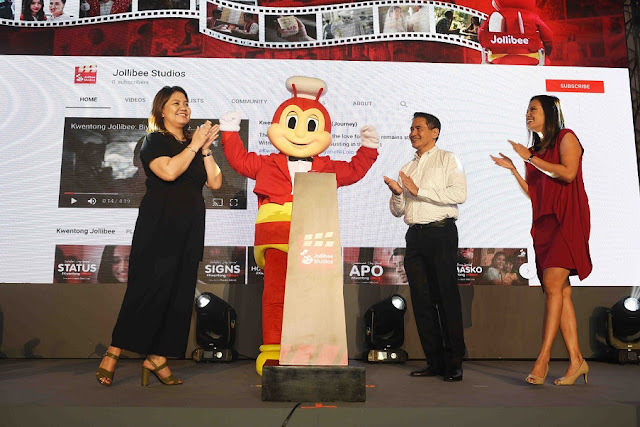 Jollibee, the country’s number one fast-food brand, is expanding not only around the world, but also online with the launch of Jollibee Studios. Jollibee Studios is the first content channel of its kind in Philippine QSR branded entertainment and aims to deliver quality content that is bound to make viewers cry, laugh, fall in love, and more. Jollibee Studios was officially launched on November 21, Wednesday in an exclusive event held at Metrotent Convention Center in Pasig City. The director and actors from the series unveiled graced the event, along with Jollibee executives, influencers, and media guests. Jollibee has been dubbed a game-changer and the country’s #1 QSR brand in digital engagement. This is thanks to the slew of heartwarming content that have touched the hearts of viewers in the country and around the world and sparked conversations between the brand and its audience. Jollibee AVP for Brand PR, Communications and Digital Arline Adeva opens the program and officially introduces Jollibee’s own entertainment channel, the Jollibee Studios. Jollibee Studios brings together a team of creatives, directors, performers, and production professionals to conceptualize and produce compelling stories of Filipinos and with the brand. Jollibee Studios houses the brand’s digital hits, including the well-loved Kwentong Jollibee videos, two seasons of the quirky, star-studded JolliSavers series 14/29: Petsa de Peligro JolliSery, and the exciting JolliDance Showdowns starring the brand’s most lovable mascot. All of these digital-led projects racked up impressive figures of views, reactions, shares, and comments on Jollibee’s official Facebook page and YouTube channel. 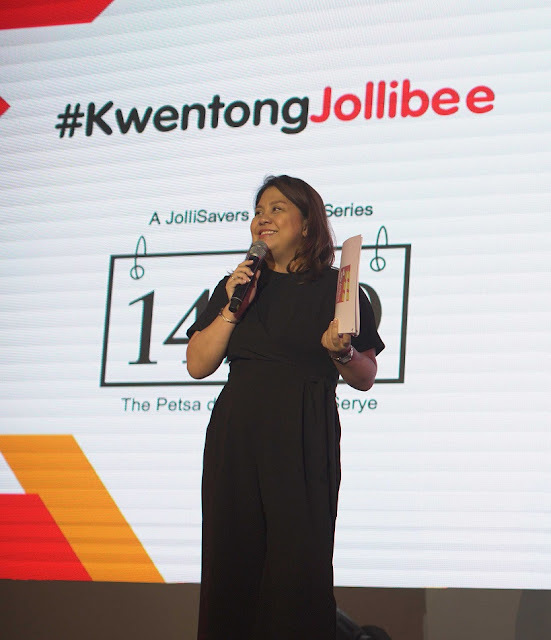 Jollibee Flagship Category AVP Cathleen Capati talks about Jollibee Studios’ fresh content, the latest episode of 14/29: JolliSerye and the new romantic digital series, One True Pairs. The latest series to burst forth from the Jollibee Studios stable is Chickenjoy Perfect Pair’s One True Pair, a romance-serye with episodes under the direction of acclaimed hitmakers JP Habac and Antoinette Jadaone. Two episodes—both revolving around love and perfect pairs—will be serving the most relatable kilig starting November 22, 2018. “By bringing together the creative and entertainment industry’s top talents, viewers can be sure that the content from Jollibee Studios is not only high-quality, but also features stories told in new, innovative ways,” added Adeva. FROM L-R: Jollibee; Jollibee AVP for Brand PR, Communications and Digital Ms. Arline Adeva; Google Philippines Industry Manager Mr. Ashok Patro; Jollibee Philippines President Mr. JJ Alano; Jollibee Flagship Category AVP Cathleen Capati; and YouTube Country Sales Lead Jolly Estaris. To date, the Jollibee Studios YouTube channel boasts of over 247,000 subscribers. “We earned those figures by ensuring that our content feels authentic, and touch on relatable experiences and situations that illustrate how Jollibee has touched the lives of generations of Filipino diners,” Adeva said. 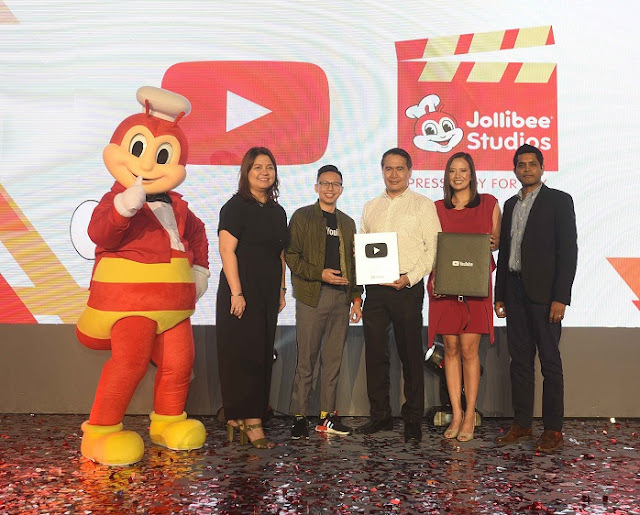 To recognize this milestone, Google was present during the launch where Jollibee Studios was awarded the Silver Creator Award by YouTube. This is a recognition only given to content creators whose channels have reached the 100,000-subscriber mark. “Pinoy netizens can expect more exciting, engaging, and heartwarming content to come their way in the very near future, all from Jollibee Studios so we encourage everyone to subscribe and keep watching!” concluded Adeva. For more information on Jollibee’s latest digital content, products, and promotions, like Jollibee Philippines on Facebook, subscribe to Jollibee Studios (youtube.com/JollibeeStudios) on YouTube, and follow @Jollibee on Twitter and Instagram.